With all the gear and no idea I flew into Kiruna in the far north of Sweden where, for the first time, I met Shane. He was already settled in to our cabin at Camp Ripan and greeted me with beer and dinner, a sure sign that he would be a good guy to have around for the next 3 weeks (although I wondered what tasks I may be able to take on besides eating and drinking whatever Shane supplied me with). After a protracted morning at the hotel devouring the buffet breakfast and humouring the Sami reporter with an interview for Swedish TV news, we cycled around Kiruna a few times under Shane’s mis-guidance (map-reading, I figured, could be my responsibility) before finding the correct road to set out on our wintery escapade with the sun shining and snow sparkling in the crisp dry air. I was brimming with excitement but managed to subdue any desires to go rushing into the white making snow angel impressions, snowmen statues and throwing snowballs at Shane. The Swedish, being used to the snow, are not prone to childish outbursts and Shane was a bit more grown-up about the whole thing than me acted as though he barely noticed the white stuff. Not wanting to appear too excitable or headstrong, I suppressed the urge to put all my pent-up energy into cycling fast. Instead, I slotted in behind Shane and went about filming us on my compact camera. 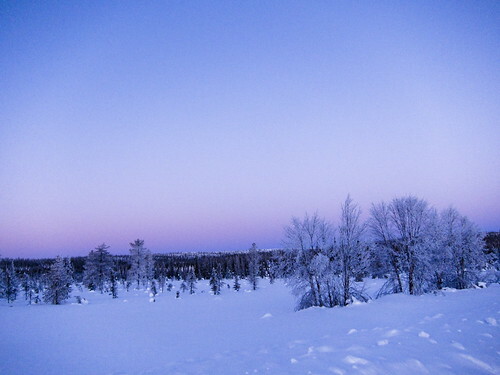 It came as a surprise when, not long out of Kiruna, he suggested we look for somewhere to camp. Daylight hours were short so far north at the end of January and he thought it prudent to have plenty of light on that first day camping. I couldn’t really see why: We had both put up our tents before and we both had head-torches to see with. What difference is a bit of snow? 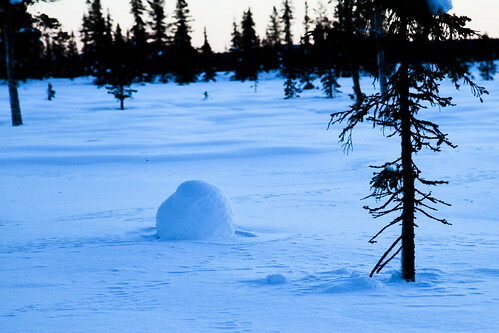 Shane leapt off the road and trampling in deep snow, disappeared through the trees along a snow mobile track. He was gone a while and I wondered what had distracted him, but he returned proclaiming to have found a spot to camp. I followed him down the hardened track and watched with amusement as he disappeared up to the waist whenever he inadvertently stepped off the track and into the uncompressed snow. It was a long sweat-inducing slog to his perfect camp-spot through field and forest that to me all looked perfect spots to camp (camp-spot-finding I figured could be my responsibility tomorrow). We spent an inordinate number of hours collecting and chopping wood for a fire but would the damn stuff light? Not a chance. Not even with a stove burning underneath (which was surprisingly easy to light); all that did was shatter the silence with its jet engine-like roar. 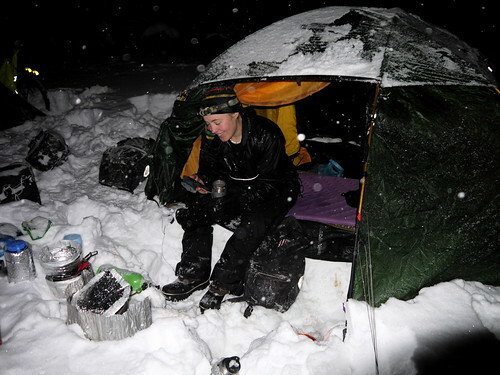 Having given up on a fire to keep warm, although the whole process of wood fetching had the same effect, Shane cooked up the dinner, which we scoffed and then retired to our sleeping bags. I woke up in the night on the verge of panic because I was far too hot and seemed incapable of extracting myself from the cocoon I had tied myself up in without getting even hotter. Finally I found the zips and drawcords and a wave of icy air rushed in to cool me down. Being cold at night was clearly not going to be an issue on this trip. I hoped the night-time temperatures would plummet lower than the -10C (I got my wish the next night). It was an unwelcome pre-dawn alarm-clock wake-up call. All to give us the most time on the road during daylight. It took a record 3 hours to melt water, eat porridge and pack up. That was something we could both work on. The temperature got lower and lower and the sky greyer and by lunchtime it was snowing and my feet were freezing. (Why I didn’t put plastic bags over my feet as vapour barriers the day before, I don’t know, but I was to pay for it for the next four days until we got a hotel and could dry everything out.) So when we came to a café, we were both happy to go in, warm up and scoff lots of hot food regardless of the extortionate prices. This welcome distraction meant that we had precious few hours of daylight cycling before camping. Shane’s wood selection for a fire was a drastic improvement, yet although we succeeded in lighting it, it didn’t give much warmth and instead I ended the evening not only with cold feet still, but with a burnt rubber boot because I’d got too close. Still, there was no denying the beauty of the forest in which we camped; tall pines, snow-covered and sweet-smelling, an untouched blanket of folds of snow interspersed only by trails of deer footprints and snowflakes that when our head-torches lit them they twinkled like diamonds falling from the sky. The thermometer reading fell less gracefully to -22C. I was still hot in my sleeping bag. The third day was even colder and while Shane finished packing up, I ran to the road for a morning warm-up aerobics in an effort to bring life back to my feet. The pain as the blood began to flow was welcome because I knew now that I would always be able to warm my feet up if I jumped around or ran enough. Frostbite was no longer a concern, just something to be aware of. It only took four days to become comfortable with our new wintry environment. 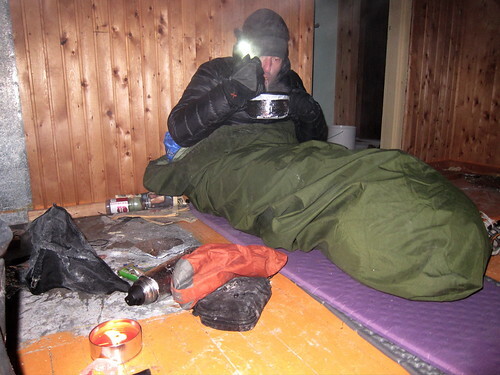 By then, I was used to the sprinkling of icy crystals on the face when I woke up and emerged from the sleeping bag first thing and used to fighting to fit my feet into the frozen boots and used to the pain of cold fingers when rolling my thermarest without gloves and of the sweat-inducing wrestle to get my sleeping bag packed away. Used to the laborious process of melting snow for water and scraping cold porridge remains from the pan (which I’m sure Shane burnt onto my pan on purpose just because, as breakfast chef, he could!). Used to filling pockets with food and toothpaste, camera batteries and phone, and anything else that is useless when frozen. It always amazes me how I go through phases of having excessive energy, drive and determination, which is what sets me upon my various adventures and then can fall to such low levels of lethargy, apathy and downright laziness, which may just be exhaustion and my body’s response to working at high energy levels over a long period. 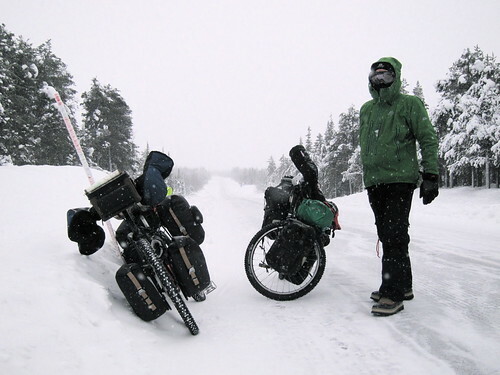 In any case, if you too are a bit like this, like a Duracell bunny with only an on/off switch, you will find yourself fantastically suited to winter bike touring. Turn on during the day and just keep going. To stop is to get cold. If you stop cycling, start walking; if you stop walking to eat, then start jumping on the spot. Turn off at night and get in your sleeping bag. The darks nights are long so you’d better be content with 12 hours glued to the spot, a caterpillar in a cocoon. Oh, and there’s one more thing, you won’t want to get out of your warm sleeping bag into the cold during the night, so the best suited Duracell Bunny is one with a strong bladder. If you haven’t seen them already, there’s more photos of all the lovely winter landscapes and of the winter biking on the website. 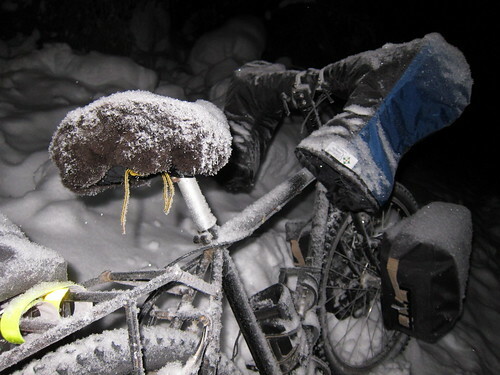 And don’t forget Shane’s write-ups too, on Winter Cycle Touring. It was interesting to read your take on the trip…great story! It compliments Shane’s write up very well. Your pictures are beautiful! You two had an incredible adventure that not very many people (like me) would ever consider doing, but enjoy reading about it. Thanks for sharing. I noted what lovely long eyelashes you have!